Simple but Fashionable: Wear it with your favorite jeans, dress or skirt .It will definitely highlight your taste and make you look slim and charming! The classic round polished buckle belt is really versatile. This stylish women belt is suitable for formal or casual wear in any season. Great for everyday wear or special occasion. This women leather belt is made of high quality genuine leather, which is quite soft and comfortable to wear, also very durable ,can last you for years. Customer Care: We aim to bring high quality belts for everyday wear, with affordable price, quick delivery and superb customer service.SUOSDEY Promise:100% satisfaction guaranteed with 90 days free exchange and return policy including 360 days warranty. ♥ Wake Up Your Wardore: Simple but Fashion, this stylish women leather belt is a perfect interpretation of minimalism style, Wear it with your favorite jeans, dress or skirt .It will definitely highlight your taste and make you look slim and charming! A Perfect accessory in every lady's wardore. 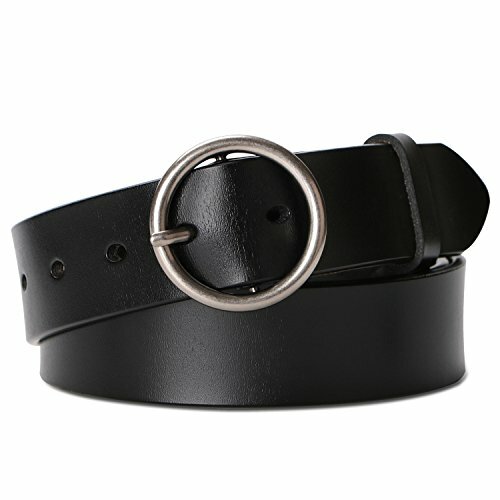 ♥ All-match Fashion Style: This is a trendy & all-match women belt, classic round polished buckle, shapes your waist well. Suitable for your formal or casual wear in any season and all occasions. Great for everyday wear, a night out, club, or a country music concert. ♥ The high Quality Leather Belt You Deserve: Unlike most leather belts that break off after a couple of times wearing, this one is going to serve you for a long time, thanks to its high quality, crafted from 100% genuine cowhide leather, it's definitely built to last. ♥ Elegant Gift Box for the Perfect Gift Giving Experience:A wonderful gift to treat yourself, to make you more beautiful and happy, also a ideal gift for family and friends. The belt enclosed in a lovely, attractive gift box. Make a big impression! If you have any questions about this product by SUOSDEY, contact us by completing and submitting the form below. If you are looking for a specif part number, please include it with your message.